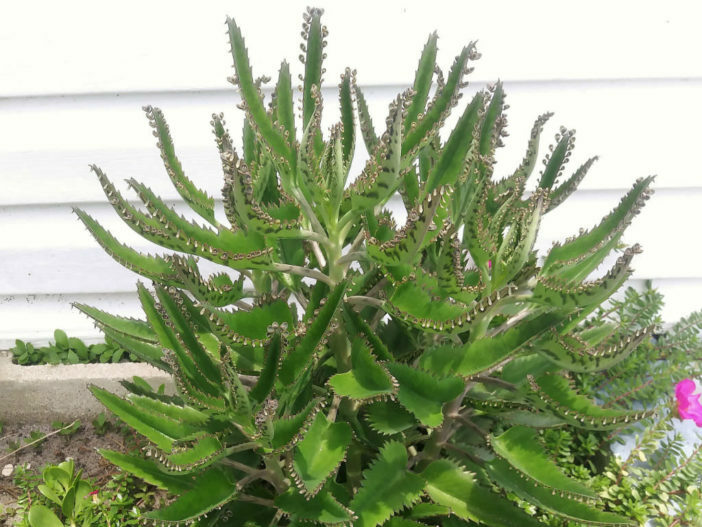 Kalanchoe daigremontiana, commonly known as Mother of Thousands, is one of the easiest succulents to grow. It is perfect for beginners. The common name comes from the little plantlets that form along the edge of the leaves of this plant. While these plantlets make propagating this plant easy, they also cause it to be an invasive species in some parts of the world. For this reason, most gardeners find growing this plant works best in a container. Its other common names include Alligator Plant, Mexican Hat Plant and Devil’s Backbone. When growing Mother of Thousands as an outdoor plant in USDA plant hardiness zones 9b to 11b, it may bloom with small, grayish pink flowers in late winter. The mother plant then dies. Feeding this plant should occur every 3 months and should consist of a balanced liquid fertilizer that has been cut in half. Propagating Mother of Thousands is very easy. You can just let the plantlets fall where they may. If you look at them while they are on the plant, you will notice that the plantlets have little roots that easily root where ever they fall. While this makes it easy for the gardener, it does have its downfall. Allowing the offspring to root where ever they may can cause plants to pop up in undesired places, which includes out in the yard and inside other pots. A better approach for those who do not want Mother of Thousands everywhere is to handpick off the plantlets before they fall off. Using this approach allows the gardener to plant the plantlets in the proper soil and in locations that they are desired.